To apply for sponsorship, email Amber@HandmadeHilarity.com with a link to your website along with the ad size you are interested in. These rates are introductory, as the Handmade Hilarity blog is brand spankin’ new, and are available for a limited time only. Gif files are allowed for ads. Q: What is a Handmade Hilarity Sponsor? 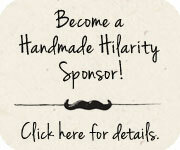 Sponsors are approved businesses that advertise with an ad on the Handmade Hilarity blog. Sponsors are only a select group of vendors related to the subject matter of this blog: photo booth companies, photographers and artisans. Q: How does the subscription work? The subscription is handled through PayPal. I will invoice you directly on the same day every month as long as you are a Sponsor. Q: Where will the ad be placed on the blog? All ads are located on the right-hand side of the blog, visible from every page on the blog. Ads will be rotated on a monthly basis, giving equal placement to each Sponsor. Q: How many hits a month does the Handmade Hilarity blog have? As this is a new blog, hit count is rapidly increasing. Statistics will be shared once it has been around long enough to have them. The Mustache on a Stick Facebook page has almost 4,000 fans and the Whisker Works shop receives more than 14,000 views per month, a number that is also quickly rising. Q: Can I cancel my ad subscription? Yes, you can cancel at any time by sending an email. Your ad will remain on the blog until the end of your paid month. Email Amber@HandmadeHilarity.com with a link to your Web site along with the ad size you are interested in. Once your site is approved, an invoice will be emailed to you via PayPal.